Number Thirteen Press just dropped their tenth book and their releases keep getting better and better. 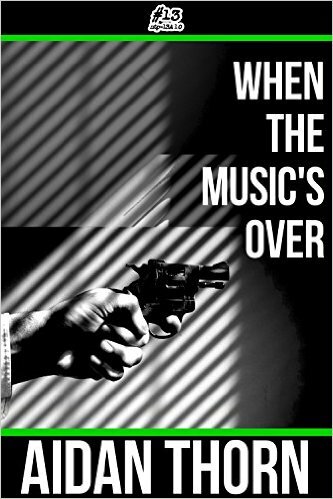 When the Music’s Over by Aidan Thorn is a hell of a hit of noir. Everything about it feels right; great characters, perfect plotting, great economy of words, and most importantly, it is a satisfying read that hooks you from the beginning and leaves you no choice but to read it to its blistering end. When Benny Gower murders the heir of a criminal organization, he sets into action a chain of events that will have ramifications for everyone involved. Benny flees the scene and sets out to make a clean getaway. Fairly standard plot, right? The kick to this one is that Benny is a man of moral integrity that leaves behind many associates who don’t believe him to be guilty, and feel that even if he is, he should be protected from the consequences of his actions. Wynn McDonald, a long retired mob enforcer, is forced out of retirement and ordered to find and exact mob justice on Benny to send a message to all who know what has happened. As McDonald searches for answers on the street, he is also searching for answers from within, as he realizes his loyalties may have changed during his time away from the mob life. While he understands he has to follow the truth where it leads him, he has his own ideas how justice may be best served for all those involved in this situation. Thorn does a magnificent job keeping the plot tight and he never seems to take his foot off the gas pedal. This novella seems to be injected with adrenaline and any reader of this one will feel that adrenaline in their own veins as they race towards the very satisfying ending that Thorn has in store for them. Number Thirteen Press is becoming a heavy hitter in the noir publishing world and this book will only further solidify their standing in the eyes of noir lovers. If you haven’t jumped on board this bandwagon, it would be in your best interest to pick up all the titles they have published and get better acquainted with a publisher that is putting their stamp on the noir landscape.